This page will provide spring 4 MVC internationalization (i18n) and localization (l10n) annotation example. Here internalization (i18n) is creating our website in more than one languages. Localization (l10) is accessing website in any specific language by setting the locale. Here we will discuss in detail how to achieve it in Spring 4 MVC. We will use java configuration to define beans using annotation. To achieve internalization and localization there are some classes and its implementation which has the major role that are MessageSource, LocaleResolver, LocaleChangeInterceptor etc. MessageSource access the resource bundle. LocaleResolver resolves the locale changed by the user by calling locale setter method. LocaleChangeInterceptor is the interceptor which observes the locale changes. In our example we will create a simple form which will have two links to localize the website in English and German languages. By default page will open in English. We are using following software and tools in our demo project of internalization and localization. 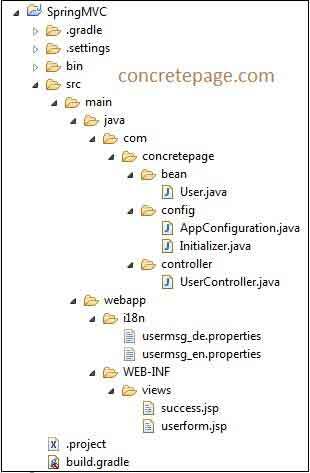 Find the print screen of project structure in eclipse. Find the Gradle file to resolve the JAR dependencies and build the project. In java configuration, we will create beans for Internationalization and Localization. To import Spring MVC configuration , annotate the class with @EnableWebMvc. To add interceptor, extend WebMvcConfigurerAdapter class. To handle resource view, InternalResourceViewResolver bean has been created. Set prefix and suffix that will resolve view name returned by the controller. org.springframework.context.MessageSource is an interface that is used to define the message source property name for internalization and localization. We can use two implementations of MessageSource. ResourceBundleMessageSource: It is used to handle message source by specifying property file base name. It uses java.util.ResourceBundle that caches the bundle forever which is a limitation. ReloadableResourceBundleMessageSource: It also loads message source property file which is reloadable. It uses java.util.Properties . To set base name, we start from the path of property file. It can be like /i18n/usermsg and WEB-INF/messages/usermsg. For the base nameusermsg, the full property file name can be as below. usermsg_en_US.properties : For english language of United States of America country. org.springframework.web.servlet.LocaleResolver is an interface that resolves locale. It can be implemented for request, session and cookies. The default implementation is AcceptHeaderLocaleResolver provided by spring MVC. But it does not support to change the locale using setLocale() method. It can be changed by changing client's locale setting. In our Internalization and localization requirement, we can use the below implementations of LocaleResolver. CookieLocaleResolver : This is the implementation class of LocaleResolver which uses cookie that is sent back on the browser for custom settings to handle locale used in internalization and localisation. This class is used for stateless web application. The LocaleResolver bean for CookieLocaleResolver is created as below. We set default locale by using setDefaultLocale() . Here we have set en locale as default . Set cookie name by setCookieName(). The max age of cookie in seconds can be set by setCookieMaxAge(). We can also set default time zone with determineDefaultTimeZone() method. Once the cookie is set in browser, then for every page we will get custom message source till the cookie expires. SessionLocaleResolver : This class is useful when there is a user session based application. This class sets a locale attribute in session for custom locale setting. In java configuration we can use it as below. SessionLocaleResolver() also sets default time zone using determineDefaultTimeZone() method. Once we set custom locale in session, then for every page we will get message source file for the custom locale till the user session expires. org.springframework.web.servlet.i18n.LocaleChangeInterceptor has the responsibility of changing the current locale if requested. Find the code snippet. We can set the locale to LocaleChangeInterceptor by the method setParamName(). The default parameter name is locale. We need to add this interceptor to InterceptorRegistry that is the argument of method addInterceptors defined in our java configuration overridden from WebMvcConfigurerAdapter. To change the locale in any request we need to add the query string in our URL as below. ?mylocale=de: Change the locale for German message source. Find the sample JSP file which we are using in our demo. We are creating a user form. There will be two link in our form, one for selecting en locale and second for selecting de locale. By default en locale is set. We can change de i.e German locale by clicking the link in any request. And then onwards the locale language will be German. Find the controller which we are using in our demo. There is nothing locale specific code in controller. This is just a simple controller that will accept a form submission. We are also using a bean which attributes are attached with the form input fields. Find the spring web application initializer. We use it to avoid web.xml. The default language is English. Now submit the form, we will get the page as given below. What we need to observer that the language of website is English in all pages. Now change the website in German language by clicking the German link. Internally it calls http://localhost:8080/concretepage-1/user?mylocale=de . We will get the page as below. Submit it then we will get the page as given below. Again we need to observe that now onwards all pages are in German. To change it again in English, click the English link that will internally call the URL http://localhost:8080/concretepage-1/user?mylocale=en. As we are using CookieLocaleResolver, so what happens that it sets a cookie named as myLocaleCookie. Check it in the browser. Now I am done. Happy Spring Learning!.